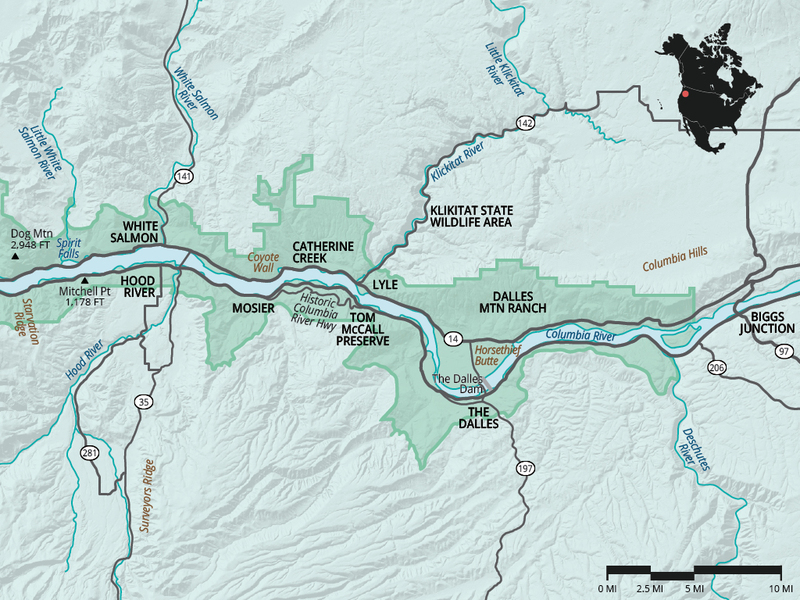 West End: Columbia River Gorge National Scenic Area Map. 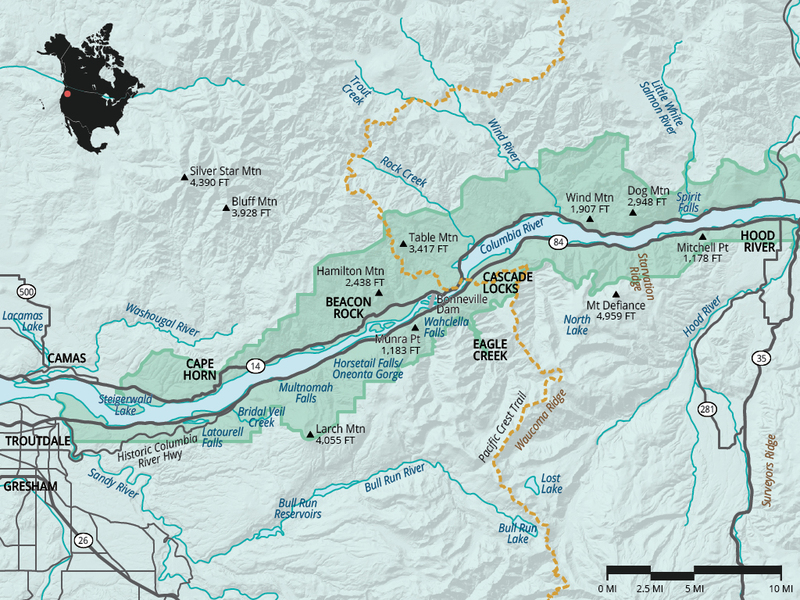 East End: Columbia River Gorge National Scenic Area Map. Collecting water from as far east as the Rocky Mountain Continental Divide in both the United States and Canada, the Columbia River discharges more water into the Pacific Ocean than any other river in North or South America. This massive river has cut a narrow channel directly through the Cascade Range, a nearly 600-mile chain of volcanic peaks, in order to reach the Pacific. Sculpted by tremendous geological events such as the Missoula Floods, cataclysmic floods at the end of the last ice age that exposed the area's basalt layers, the Columbia River Gorge stretches roughly 80 miles from east to west, up to 10 miles from north to south, and measures up to 4,000 feet deep. The Columbia River Gorge National Scenic Area was created in 1986 to protect the natural beauty of the Gorge. 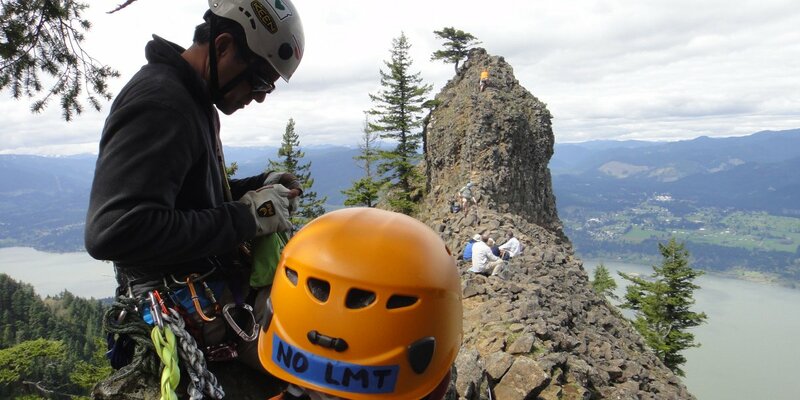 It includes both public and private land in Oregon and Washington with countless stakeholders, and it is by far the nation's most extensive National Scenic Area. Managed by the Forest Service and the Columbia River Gorge Commission, it extends 83 miles from the confluence of the Sandy River to the Deschutes River on the east side and encompasses 292,500 acres. 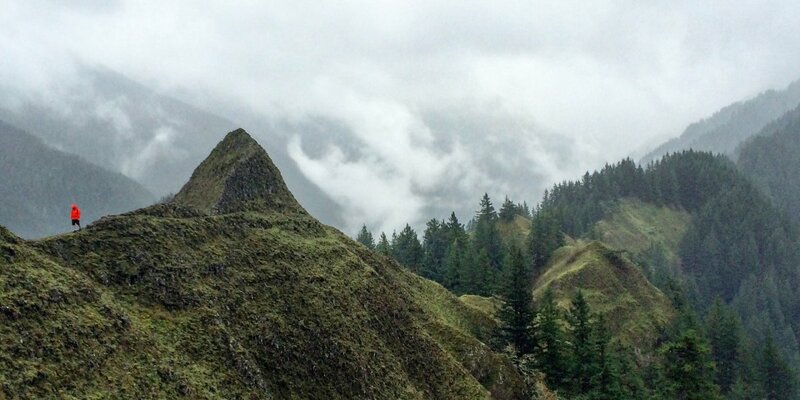 The Columbia River Gorge is perhaps best known for its dramatically chiseled walls, but one of the features that makes this area so unique is the stark contrast in annual precipitation between the western to eastern ends. While areas in the west end of the Gorge may receive up to 100 inches of rain annually, the east end may receive as little as 10 inches annually. This contrast is manifested in the old-growth forests and waterfalls that dominate the western portion of the Gorge and the wildflower-filled golden hills that unfold in the eastern portions. In fact, the pounding rains on the western side of the Gorge have created one of the densest concentrations of waterfalls on earth. For those visiting from afar and those who live in the region, the Columbia River Gorge is a recreational mecca. Not only are there dozens of hikes to waterfalls, prominent peaks, and wildflower meadows, the Gorge is renowned for world-class windsurfing and kitesurfing that is fueled by the sustained winds. There are also plenty of boat ramps for salmon and sturgeon fishing, mountain biking trails (particularly on the east side), kayaking, wildlife viewing areas, beaches, swimming holes, state parks, roadside viewpoints, and numerous campgrounds and lodges to spend the night. To get started, every first visit in the Columbia River Gorge ought to start on the Historic Columbia River Highway with a stop at the Portland Women's Forum and the Crown Point Vista House. The highway, built between 1913 and 1922, is now listed on the National Register of Historic Places as well as being a National Historic Landmark. The intermittently connected scenic highway parallels I-84 on the Oregon side of the Gorge. It passes some of the most prominent waterfalls (Latourell, Bridal Veil, Wahkeena, Multnomah, and Horsetail) on the west side and wraps around the Mosier Plateau on the Gorge's east end. Hiker on the Munra Point Trail. Photo by Aron Bosworth. Hiking opportunities in the Gorge are limitless, and it can be a lot to take in, but here's a quick digest. The easiest and most waterfall-filled hikes through old-growth forests are located on the west end of the Oregon side, but these also are by far the most crowded. The Washington hikes are surprisingly less crowded (Dog Mountain being an exception) and offer the biggest vistas, but these are also some of the most strenuous. You'll want to be wary of poison oak the further east you venture, primarily in the Hood River and Mosier longitudes. Stunning wildflower-filled meadows of balsamroot and lupine can be found on most hikes on the eastern end of the Gorge in late April and early May. Climbers at Indian Point. Photo by Joshua Lupkin. Although many of the cliffs that line the Gorge are composed of crumbling basalt that is unsuitable for climbing, several developed crags are deliciously challenging and prompt thoughtful and imaginative movement. From the tall, bustling, lycra-filled outdoor gym that is Ozone to the sprawling desolation that is Horsethief Butte, the Gorge provides a crag for climbers of every persuasion. Though rock quality and style varies greatly, the epic and sweeping views of the Gorge from the top of a pitch never cease to amaze. The expansive and rolling hills suggest that undeveloped crags await some intrepid exploration and a creative perspective. Broughton Bluffs, Lewis + Clark State Recreation Area. 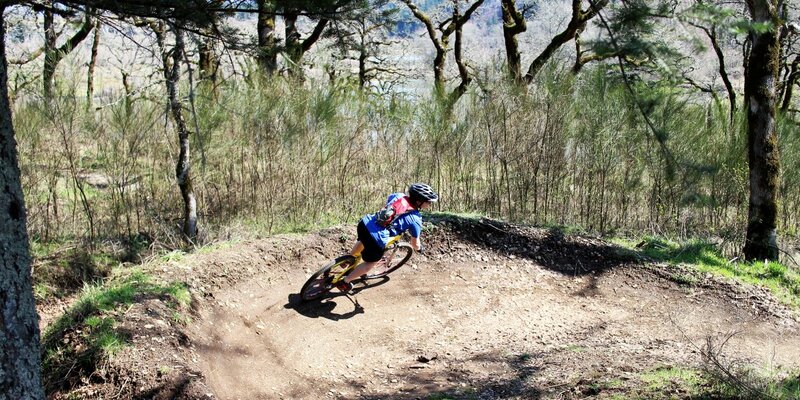 Mountain biker on the trails at Cascade Locks. Photo by Alex Zimmerman. Not nearly as accepted or ubiquitous as hiking trails, the most popular mountain biking accessible trails and networks in the Gorge are relatively isolated to the Washington side of the river and predominantly east of White Salmon, but those that exist are heart-pounding and will keep you coming back for more. Venturing outside of the boundaries of the National Scenic Area, predominantly in Oregon, more trails become accessible, such as Waucoma Ridge or Surveyor's Ridge. 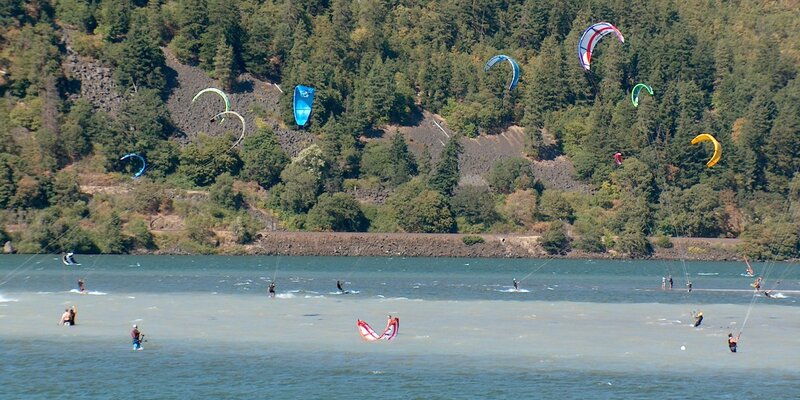 Kitesurfers on the Columbia River outside of Hood River. Photo by Tyson Gillard. With highly differentiated air pressure on both the east and west ends of the Cascade Range, the Columbia River Gorge is a 4,000-foot deep wind tunnel where sustained winds of 35 mph are common. Although the wind can be mildly annoying at times, it has also put the Gorge on the map as a world-renowned destination for windsurfing and kitesurfing, and Hood River is most certainly its capital city. For a complete guide of all of the best locations, visit our friends at Columbia Gorge Windsurfing Association. 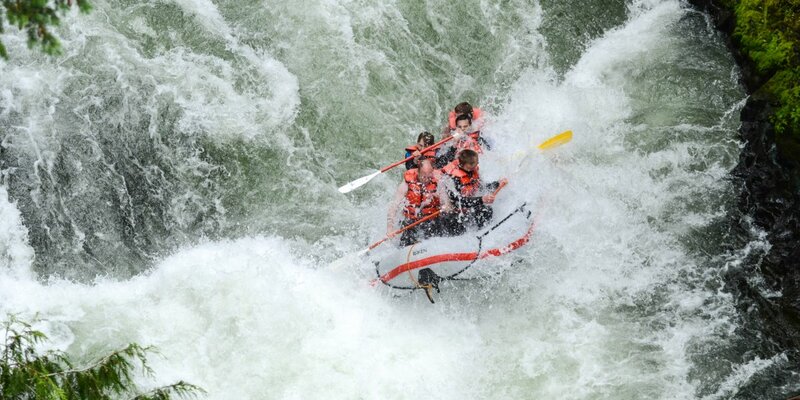 White water rafters on the White Salmon River. Photo by Adam Elliott. 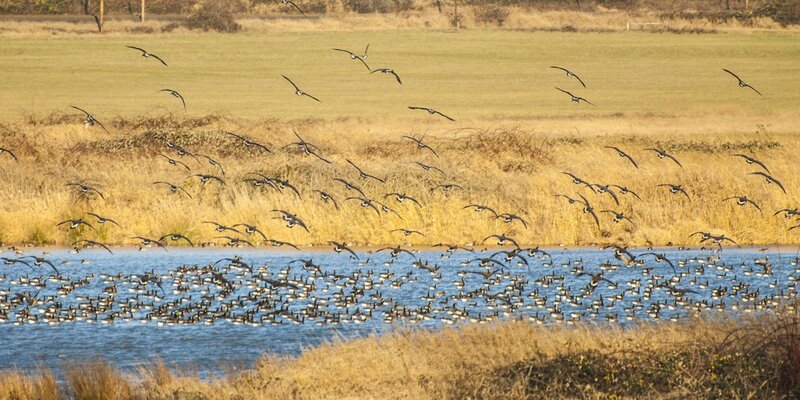 Canada geese (Branta canadensis) in Scaup Pond at Steigerwald National Wildlife Refuge. Photo by Tyson Gillard. Although the Columbia River Gorge doesn't have the same level of nature and wildlife habitat protection as a Wilderness Area designation, wildlife viewing opportunities are still plentiful. Perhaps most noteworthy are the spring and fall salmon runs. As the largest river to flow into the Pacific Ocean in the western hemisphere, the Columbia River has an abundance of fishing opportunities. Salmon, steelhead, and river trout can be found year round with a particular abundance during the spring and fall runs, and legendary sturgeon are primarily found below Bonneville Dam. Shad, walleye, panfish, largemouth and smallmouth bass can all be found in the smaller tributaries and lakes throughout the Columbia River Gorge. For a comprehensive guide to some of the best fishing spots in the area, view the recommendations by our friends at Skamania Lodge. And don't forget to check into fishing permits for Washington and Oregon. 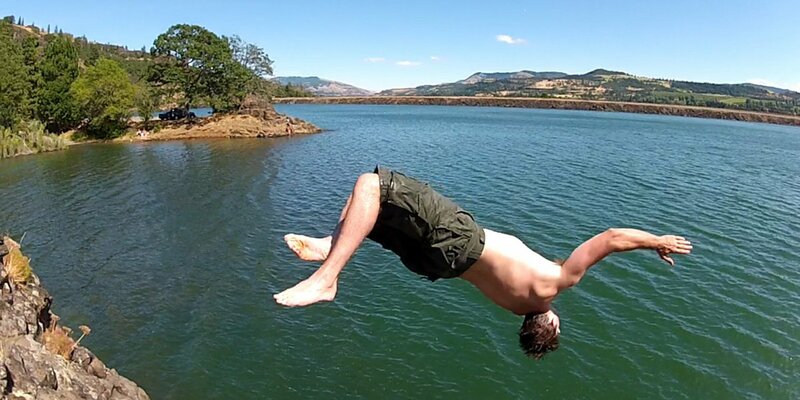 Cliff jumping at Rowland Lake. Photo by Tyson Gillard. When the temperatures soar above 80 degrees during the summer months, there can be nothing more refreshing than to set up camp along a river or lake and take the plunge into refreshing and cool waters. The Gorge offers plenty of opportunities for such bathing. Campground at Columbia Hills Historic State Park adjacent to Horsethief Lake. Photo by Tyson Gillard. 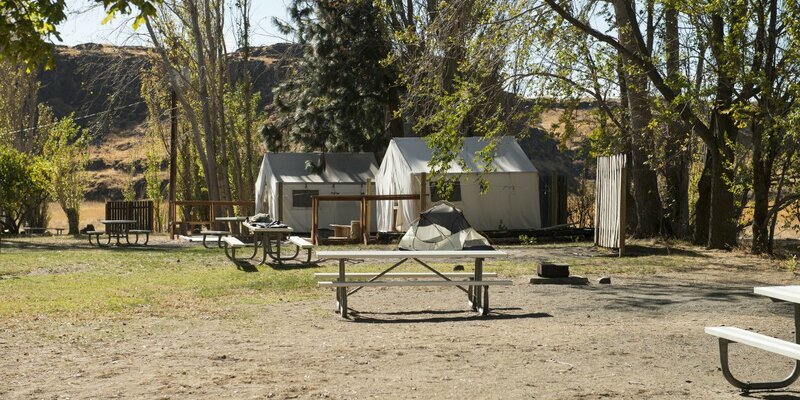 Although the Gorge has no shortage of campgrounds, it is certainly one aspect of the area that leaves much to be desired. On both the Oregon and Washington side of the river, nearly all of the campgrounds are located within a short distance of the railroad, where it is common to hear trains passing throughout the night. Worse yet, on the Oregon side, white sound radiating from I-84 exacerbates the issue. Viento and Memaloose, for instance, are flanked by the railroad and freeway on both sides. Beacon Rock State Park Campground on the Washington side is surely the quietest, and therefore most desired, campground in Gorge. As for more civilized accommodations, there are plenty of incredible and iconic lodges in the region where you can rest your head. A handful of the best are listed below. Largest National Scenic Area in U.S. Countless waterfalls. Broad and diverse gorge. Notoriously icy roads and wind during winter months. Fall in the gorge is seriously my favorite time to visit. All the autumn colors you could ever hope for combined with these magnificent falls? Ideal! Spring wildflowers in the gorge bring vibrant colors to the landscape. Spring in the gorge brings vibrant greens to the landscape.